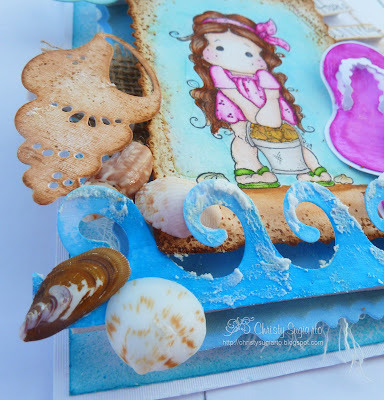 She is from the Sea Breeze Collection 2013. I have sponged the paper edges with vintage photo distress ink. sea shell, twine, charm, ribbon. I used sentiment from Magnolia stamp too. Thanks so much for stopping by, and have lovely Sunday. Very sweet card! Thanks for joining us at Midweek Magnolias. Lovely Creation, such a lot of work, I love how your have sponged the frame around your little cutie, very effective Christy. Love the overall design, just perfect!Thank you so much for sharing your creativity with us at Marvelous Magnolia honey. This is just beautiful Christy! Your colouring is gorgeous and I adore the flip flops! Thank you for sharing with us at Marvelous Magnolia, good luck and I hope you will join us again.